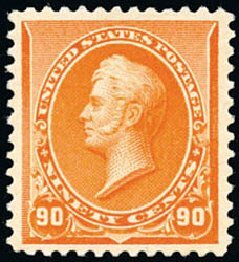 U.S.; General Issues, 1890, 90¢ Orange, #229, l.h., large margins, Very Fine, PF (2002) cert. Scott $475. Estimate $240-270. 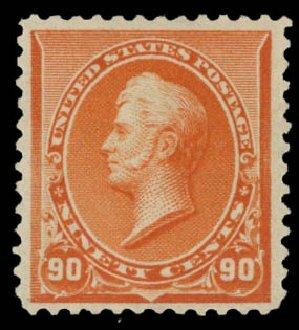 1890, 90¢ orange (Scott 229), bottom margin single, o.g., barest trace of hinge, attractive margin single with lively rich color, Fine to Very Fine. Scott $475. Estimate price $250 – 350. 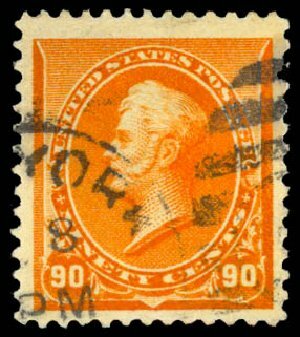 1890, 90¢ orange (Scott 229), neat black cancellation, huge margins and bold color, a magnificent example, Extremely Fine. Scott $150. Estimate $150 – 200. 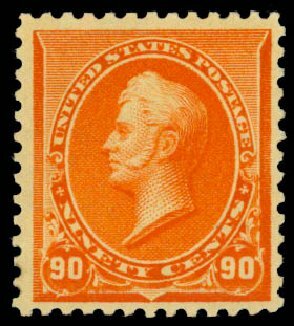 1890, 90¢ orange (Scott 229), o.g., previously hinged, attractive well centered example with generous margins and fiery bright color, Very Fine, 2012 Weiss certificate. Scott $475. Estimate $350 – 500. 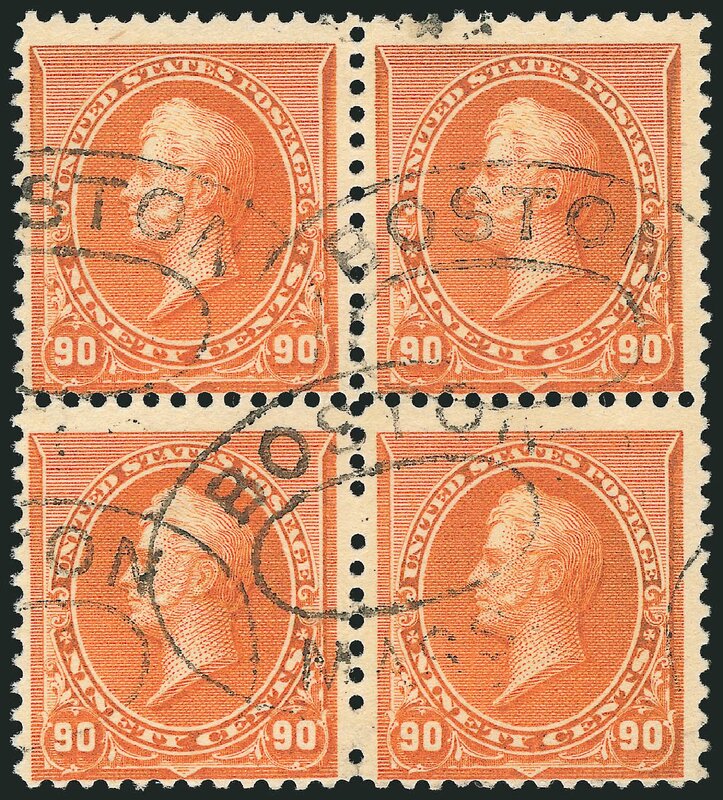 1890, 90¢ orange (Scott 229), a beautifully centered horizontal strip of 4, canceled heavy New York REG ovals, each stamp a “Jumbo”; right stamp with a corner crease, otherwise Extremely Fine, a rare large multiple. Scott $600 ++. Estimate price $300 – 400. 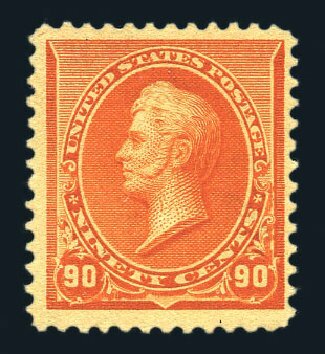 90c Orange (Scott 229). Top imprint and plate no. 25 block of ten, original gum, lightly hinged, vibrant color, right stamps natural “lightning bolt” paper wrinkle from production FINE-VERY FINE. 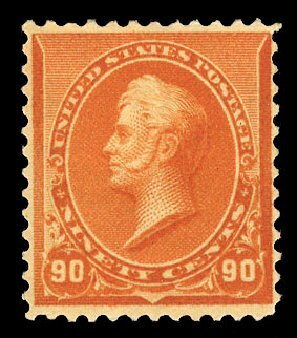 A BEAUTIFUL AND RARE LIGHTLY-HINGED PLATE BLOCK OF THE 90-CENT 1890 ISSUE. 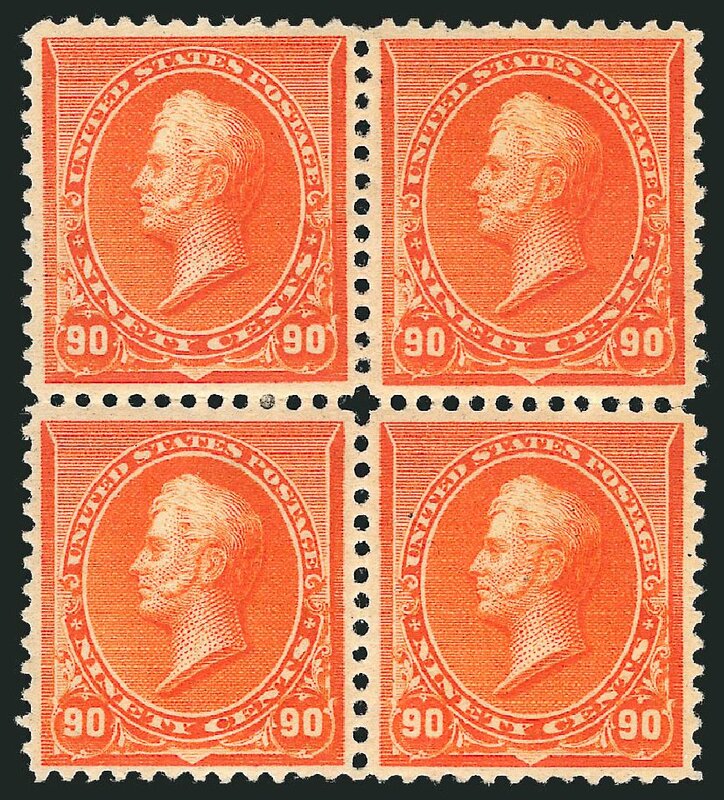 Plate 25 was the only plate used to print the 90c 1890 Issue, and plate blocks of this high value are exceedingly rare. 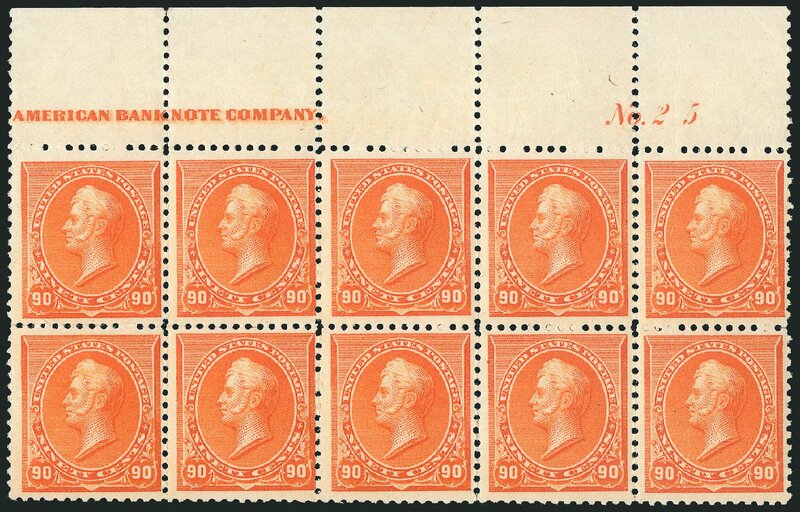 Apart from the bottom position plate block in our recent Curtis sale, one has to go back to 2003 to find another in one of our auctions. 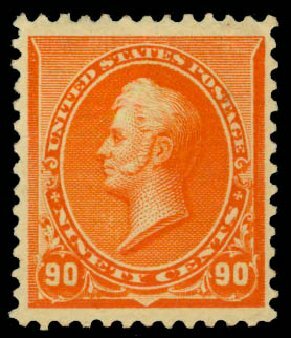 1890, 90¢ orange. O.g., lightly hinged, vibrant color, wide margins, Very Fine and choice, with 2002 P.F. certificate. Scott No. 229; $475. 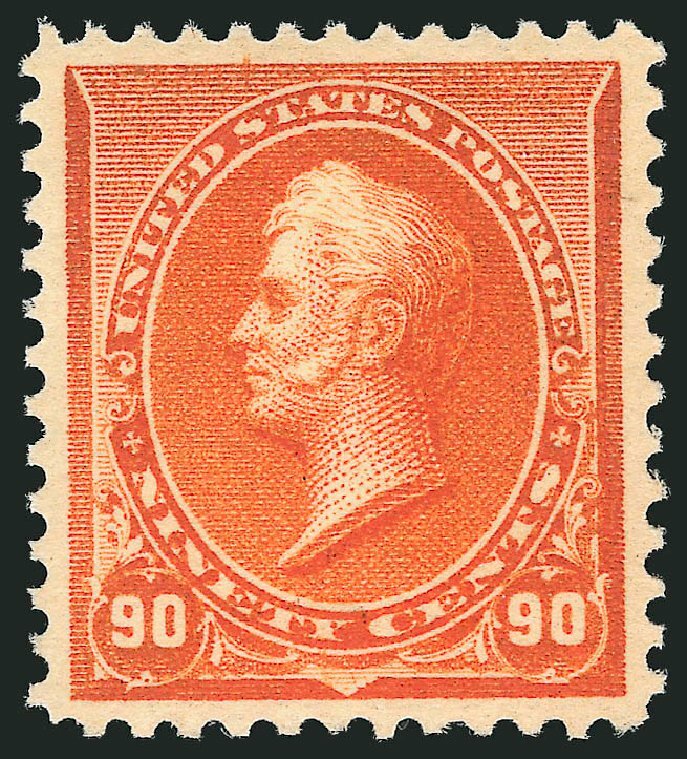 United States 1890-93 Issue 1890 90c orange, heavy h.r., fine, with 2006 APS cert. 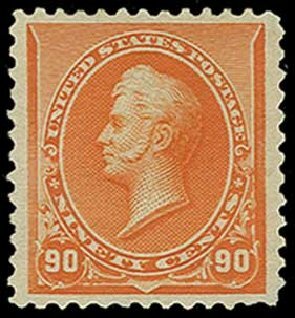 1890, 90¢ orange (Scott 229), o.g., previously hinged, marvelous example with scintillating rich color and choice centering, a very pretty 90 cent Perry, Very Fine to Extremely Fine, 1978 P.F. certificate. Scott $475. Estimate value $350 – 500. 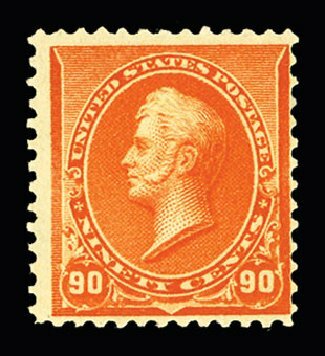 1890, 90¢ orange (Scott 229), o.g., lightly hinged, gorgeous example with an incredible depth of color with nicely balanced margins, Very Fine. Scott $475. Estimate price $300 – 400.